Happy Thanksgiving weekend to everyone! Hope you are as stuffed and happy as we are! We had Wyatt and Christina over for supper on Saturday, so I made more food that I would have for just us, and of course, being the Martha wanna-be I am, loved every minute of the fussing and baking and cooking. 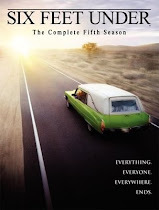 I could do without the cleaning, so I think that I REALLY want to be Martha-who-has-a-maid-, plus Martha-who-has-someone-ELSE-to-run-to-the-store-because-you-forgot-effing-gravy. I made my sweet potato casserole which only Kade and I like. So not sure if I will make it again for Christmas, but man, I think its fantastic! 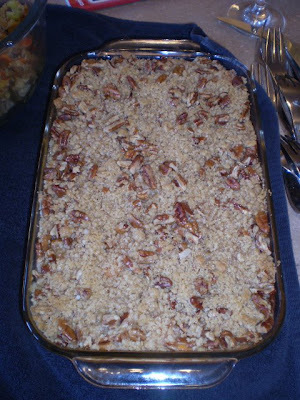 Sweet potatoes baked with milk and eggs and brown sugar to make it a little sweet, then a crunchy pecan topping on top. YUM! I understand the use of buffet's and sideboards everytime I have people over, its totally another counter in my kitchen, which I always need. 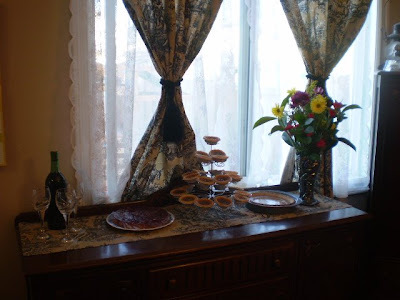 This time I made it the dessert buffet, and thanks to Dad's fantastic port that he made (this is next on my list to make) we even had a dessert wine. Oooh so fancy schmancy for just us LOL! Then today we decided to go thrift shopping and Mr K was the deal finder, he found this mummy under a table, dragged it out and came running over "Mommy! 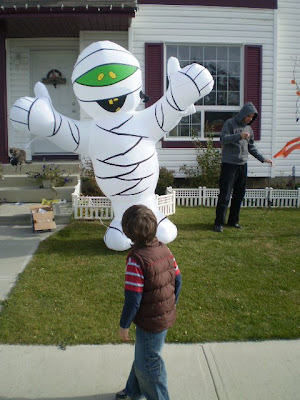 I found a blow-up Mummy!!!" and of course I bought it, $19.99 for what turned out to be a completely intact, brand new Halloween blowup! Love it! I am far too lazy to type out all my book finds so took a picture, which might have taken more time in the end, but I still *think* it was easier. We also found a huge kids Atlas which Mr K loves, and about 6 Christmas kids books as well that I am going to tuck away for few weeks yet. 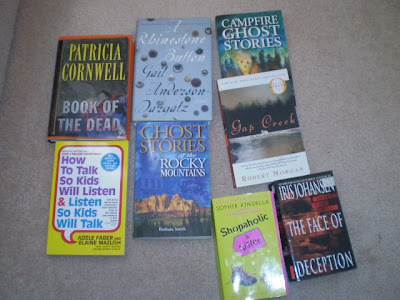 I LOVE finding the ghost story books there, at $2.49 they are an entertaining read. Ooh and I picked up a Christmas craft book too, whee! 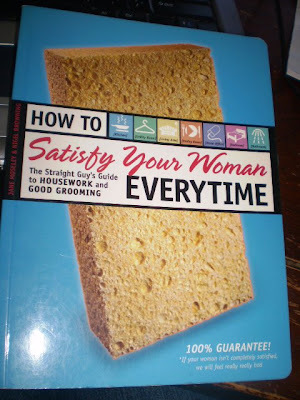 Ok, and this book made Mike and I laugh in the store, its PERFECT for a gag gift for some guy at his office! If you click on it and read the guarantee on the front its funny too! So all in all we had a really good weekend, I didn't bother taking tomorrow off since its stat pay for me and Mike is home anyways, so I'll be in at work. sean likes that casserole too. i only made it once because no one else really ate it.